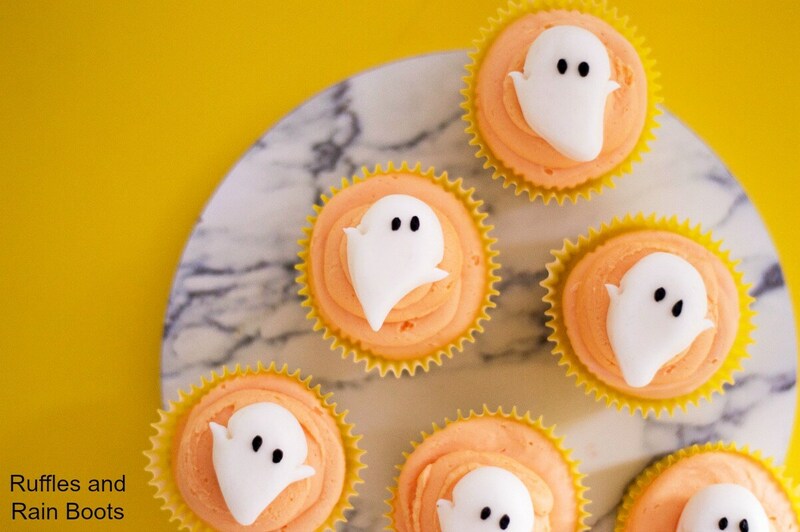 Make these adorable ghost cupcakes for a movie night or for a sweet, non-scary Halloween cupcake. I’ll even share a quick icing recipe, so let’s get started! We love, love, love having a themed family movie night here at Ruffles and Rain Boots. We recently showed my daughter, Casper, the Friendly Ghost and thought this cupcake was perfect for the fun. It’s ridiculously easy to make and would also work as one of the most perfect Halloween cupcake ideas, too! 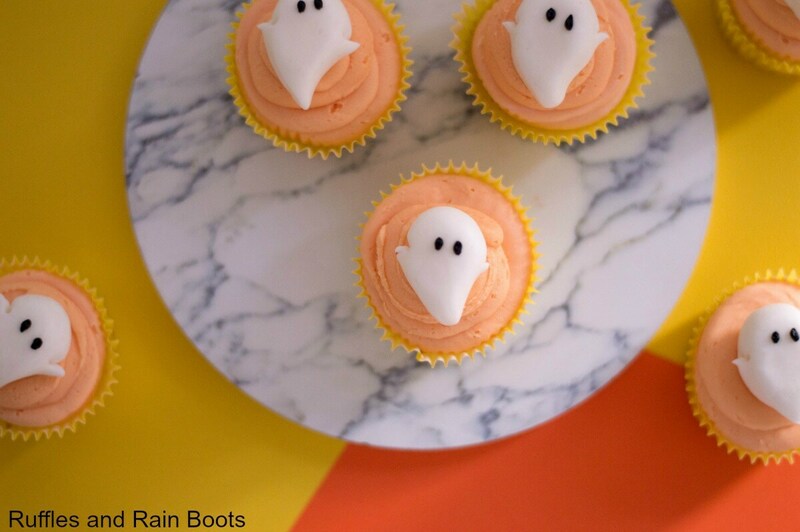 If you’re putting together a Halloween party with younger kids, this is a non-scary ghost cupcake idea they will love. 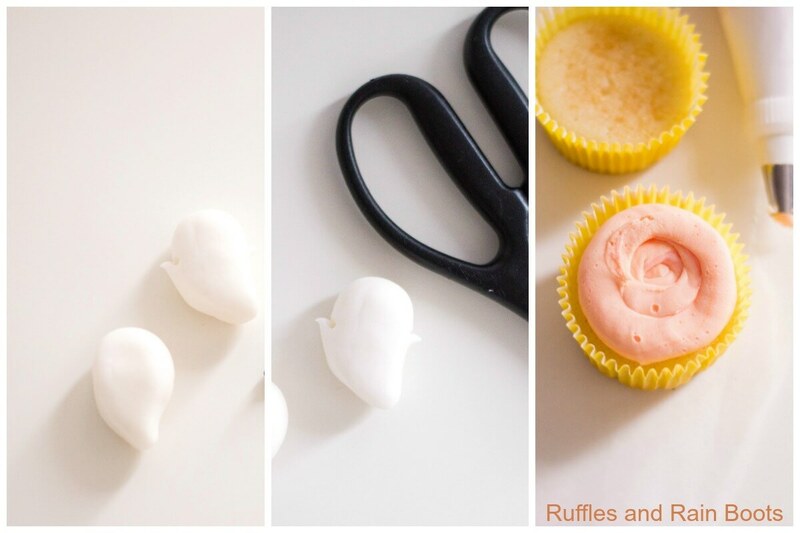 Let’s get started making these adorable cupcakes. If you want more kid-friendly spooky fun, click here to go to all of our Halloween crafts and food. 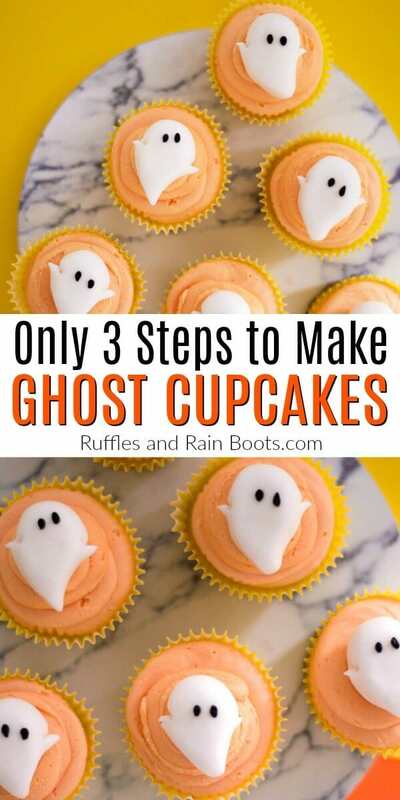 This recipe will make 12 cupcakes with ghosts and can be adapted with any color icing to fit your movie night or Halloween theme. 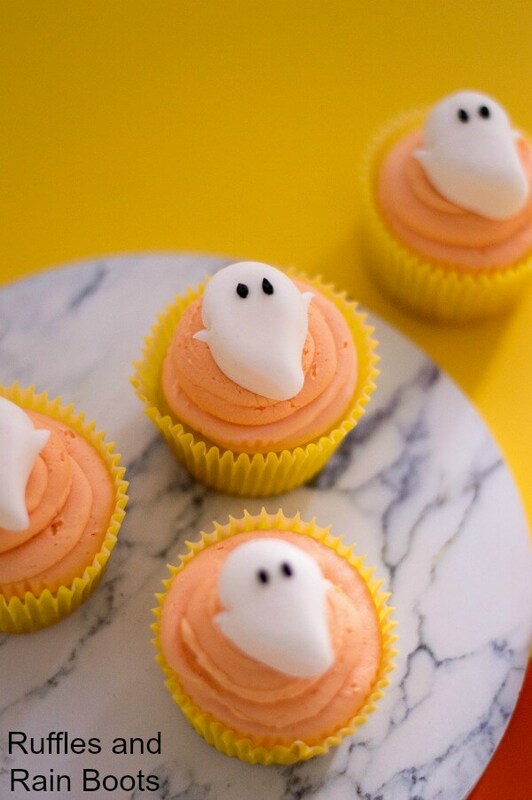 These are such an easy cupcake idea and we’ll make both the icing and the fondant ghosts. Line a cookie sheet with parchment or wax paper and set aside. Roll the fondant into 12, 1-inch balls. Flatten the ball into an oval shape, pinch one end so it forms a point, and curve it a bit by bending it slightly to one side. With scissors, snip a very small section on each side of the fondant ghost shape to form the arms. Place the ghost on the cookie sheet and add a small dot for each eye. With an electric mixer on low, beat butter, milk, and powdered sugar together with 2 drops of yellow colorant and 2 of red. Increase the speed of the mixer to medium and beat until smooth icing forms. Place into an icing bag and frost the cupcakes. Place a fondant ghost on top of your iced cupcakes and you’re done! 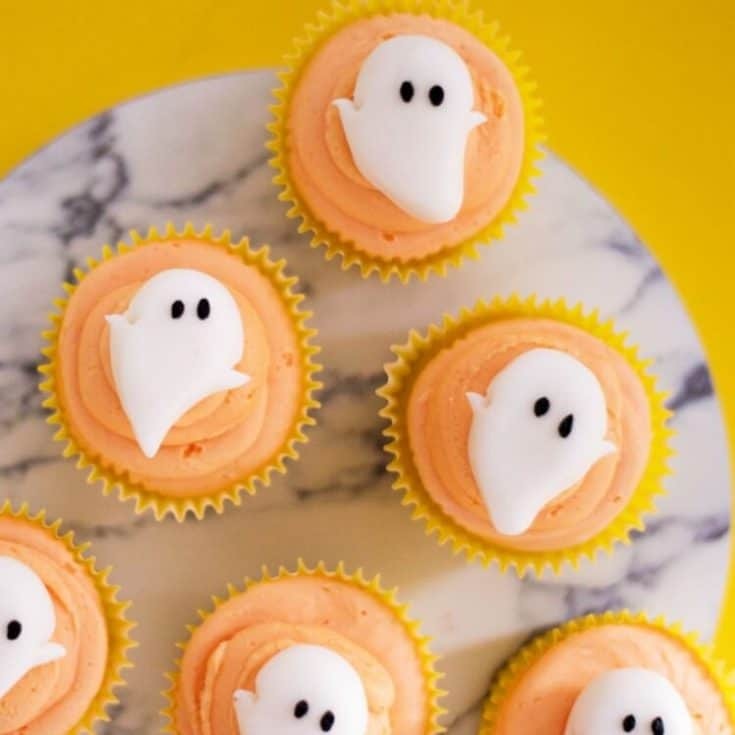 These are the cutest ghost cupcakes ever! 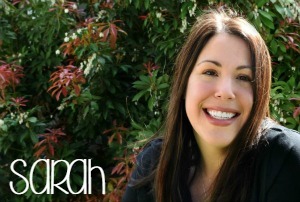 Your shares are how we grow and we are sincerely thankful when you share.